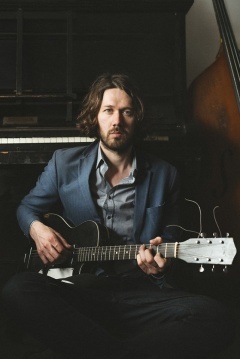 Scottish Singer-songwriter and multi-instrumentalist Adam Beattie is now living in London. He has been active since 2003 and has release 4 albums of original music. Having roots in Scottish folk music, as well as a lifelong interest in old time jazz, blues and other folk styles, his music spans many genres, but is all held together by Adam’s distinctive voice and narrative lyrics. He tours regularly and plays solo and full-band shows frequently in London. He has played opening shows for many of his musical heroes; Bert Jansch, Jolie Holland and Sean Hayes. Collaborated on guitar and bass with Brooke Sharkey, Scott Hirsch and Micheal Chapman. Adam has recently formed a new group called PicaPica featuring singers Josienne Clarke and Samantha Whates and producer Sonny Johns, which is signed to Rough Trade Records. He is also part of Band of Burns, an 11-piece band of singers and instrumentalists. Adam contributes interpretations of Robert Burns songs as well as original compositions, they are booked to play Celtic Connections in Glasgow on burns night at The Old Fruitmarket. 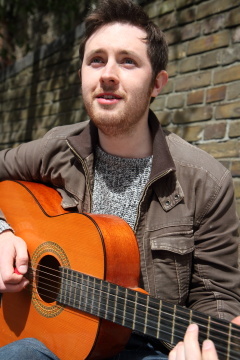 Hailing from Wales originally, Tom Blackburn is a folk guitarist and singer who mainly plays in the traditional style. Influenced by such figures as Martin Simpson and John Doyle, he is an experienced performer on the London folk club scene and is known for his intricate acoustic guitar arrangements of traditional folk songs. Tom weaves his own original compositions and tunes around older ballads and airs from the English and Irish folk tradition.